Remote Device Reboot within the Uboss portal is available at the Business Level and provides the ability to control end user devices without having to ask the customer to restart locally. Configure Multiple Devices – This will list every device at the Reseller or Business level. Select individual devices or a device type from the drop list. Tick to select the required individual devices and click the “Configure Devices” button. This will load a new config file for the device on the Uboss HTTPS server. Restart Devices – This tab will display all remotely rebootable devices in the customer group. Select individual devices or filter by device type in the drop list. Click “Restart Devices” to begin immediate reboot of selected devices. For users that are currently on the phone, the reboot will happen when they are back on hook. Customer Use Case – You are most often going to reboot a customers phone when there is a change you have made to the device. 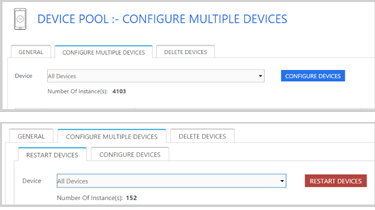 In this way Configure Devices and Reboot Devices in Device Pool works well in conjunction with Device Configuration Options. This page is found in Settings > Device > Configuration Options and lists all the device types in the customer Group. If you make changes here you will then need to use “Configure Multiple Devices” in Device Pool to build the new HTTPS config file for the phones and then restart Devices for the new config to get downloaded to the device. For example, if a customer wanted to change Yealink T42 users only to a specific codec, you can use the above method to mandate this change for the T42 in the group.